Millet Kheer Recipe with step by step instructions.తెలుగు వెర్షన్. After breaking my keto diet I started using Millets in my regular cooking. now it became our staple food. we replaced white rice with millet rice and brown rice. 1/2 cup of millets serves 2 moderate eaters. millets have medium Glycemic Index. i.e they have a low glycemic index when compared to rice and wheat. so we started using them to maintain the same weight. and it’s working actually :). But millets are a little pricey than the rice. 500 grams organic millets pack is about 60 to 80 rupees. I used Foxtail Millets for this recipe. you can use any millets like Kodo Millets, Barn Yard Millets, Proso Millets or little Millets. all these millets have different nutritional values and health benefits. we have been using all these millets from the past 6 months. and feeling really good. so I suggest you to replace tapioca, rice, and vermicelli for making kheer. millet porridge tastes really good. 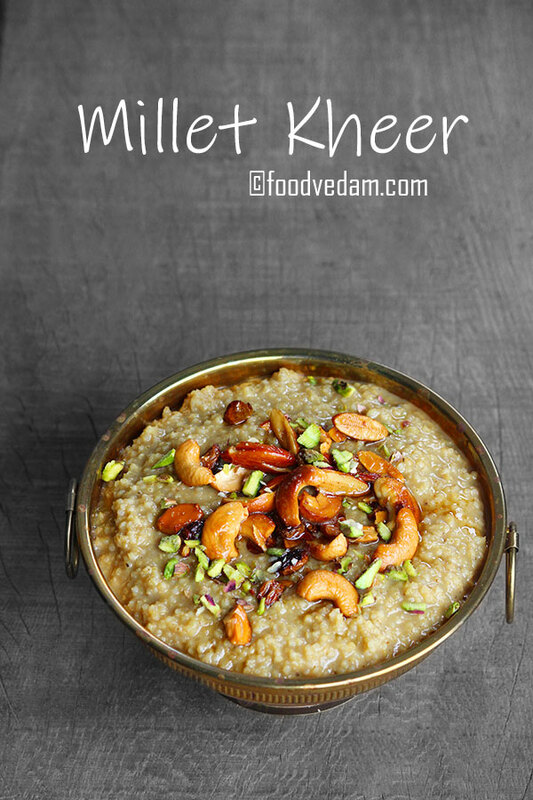 I hope you try and enjoy this healthy and nutritious Millets Porridge Recipe. watch the video below for the detailed view. Soak millets in water 30 minutes. Meanwhile, you can prepare Jaggery Syrup. Take jaggery into a saucepan, pour ½ cup water and keep it on a high flame. When the syrup starts to boil, turn the flame to simmer and add crushed cardamoms. Boil on simmer until the syrup turns greasy. String consistency is not required. You should feel like touching oil when you touch with your fingers. When the syrup is ready, turn off the flame and keep aside. Rinse the millets, pour 2 ½ cups water and keep it on a high flame. When the millets start to boil turn the flame to simmer and cook until perfectly done. 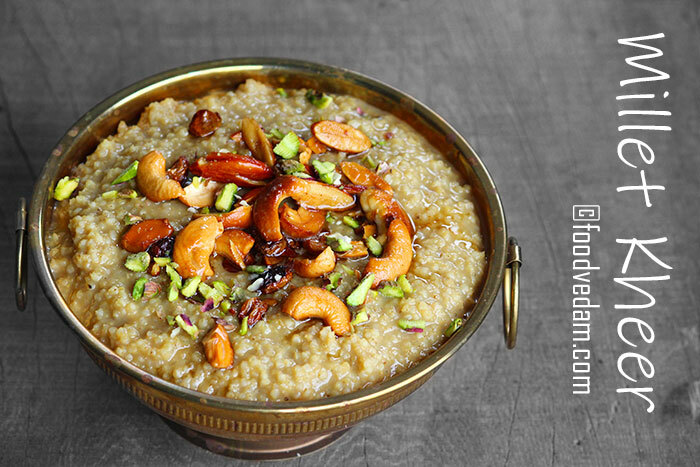 Meanwhile, melt ghee in a small pan and roast cashew nuts, almonds, raisins until they turn light brown. Keep aside. 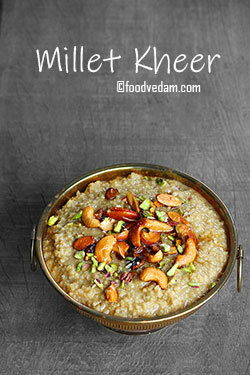 When the millets are perfectly cooked, add boiled milk, mix well and cook until the milk disappears. turn off the flame and keep aside for 5 minutes. Later, pour the jaggery through a strainer and mix well. Add roasted nuts serve hot.